I don’t really need any more words, the pictures say it all. OK, the first photo is a “what-if” mock-up I found on the Frack Free Ryedale website; the second is a real photo I took myself. As I have written repeatedly, I am not saying for one moment that fracking is without problems, or that it should be approved left, right, and centre, against the wishes of local communities. All I am saying is: whatever problems fracking has, wind energy has the same problems multiplied by ten. If you’re just discovering some of these issues for the first time, well us Wind Warriors have already been through all this, with a fraction of the support from so-called “environmental” organisations, who have proven to be as much use as a sick headache. Aesthetically at least, I can make the logical case that fracking is less harmful to the environment than wind power. If the photo above is anything like accurate, well the fracking wells look like nothing more a couple of fairground rides! They don’t alter the skyline or general shape and feel of the countryside at all. The red paint isn’t ideal, but it’s no worse than the sickly white paint of the turbines; it’s not artificially high-visibility or in any way in opposition to the surrounding colours. The well towers are in keeping with the basic physics of nature, tapered and peak-shaped, rather than the “upside down”, top-heavy, creepy-looking appearance of turbines. Fracking’s land take is significantly smaller than wind energy’s, with the ability to generate dozens of times the energy a wind farm can generate in the same space, 24 x 7 to boot, as opposed to stopping and starting with the breeze. What about other environmental problems associated with fracking? Well, anything to do with the construction of the wells has to be matched against the construction of huge wind turbines (taller than the Blackpool Tower in many cases) and their foundations. These fracking wells look barely a couple of storeys high. Any complaints about HGV access tracks – ditto, nothing we haven’t already suffered. I’ll wager there are more trucks involved with a wind farm than a fracking site, to transport all the components of these Blackpool Tower-sized monstrosities. Water pollution? We already have that. Whitelee Wind Farm near Glasgow has been accused of polluting the local water supply. And ask the residents of Whitworth who fell ill after arsenic entered the food chain following the construction of Crook Hill Wind Farm. Animal deaths? Check… also at Crook Hill, where seven cows mysteriously died. Risk of landslides? Check… Derrybrien Peat Slide in Ireland. I challenge people to name one eco problem associated with fracking that you don’t get equally, if not worse, with wind energy. That doesn’t mean all the things about wind power that piss me off don’t also apply to fracking, far from it. If I don’t like the Planning Inspectorate overruling local sentiment to force through a wind farm against people’s wishes and without their consent, then equally I don’t like them forcing through a fracking site anywhere people don’t want it. I’d rather keep the corporations out of the countryside and allow local communities the final say in the shaping of their landscapes. I know the North York Moors relatively well, albeit nowhere near as the Peak District or the Yorkshire Dales, and it is a beautiful part of the world that really should be looked after with the utmost of care and attention. Still… I don’t know. When I stare at the picture above of how fracking would impact on the landscapes of the North York Moors, all I see is a small funfair coming to town for a few weeks. Whereas when I stare at the picture of the wind turbines, all I see is the earth’s energy being sucked out of it by sinister, vampiric-looking totems of darkness. I know this runs counter to the conventional wisdom of most of the 20th century eco movements and all their propaganda, but I can only say what I see and how my mind interprets it. 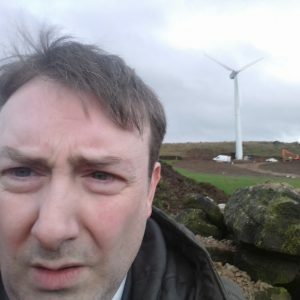 Fracking to my eyes looks efficient and relatively harmless, aesthetically not too out-of-keeping with rural landscapes; whereas the wind turbines look toxic, dangerous and totally out-of-place. I should imagine that virtually all Wind Warriors agree with me about the negative impacts of wind energy, although there will be some debate about how strongly people support fracking. Some Wind Warriors are as equally opposed to fracking as they are Big Wind, whereas others believe we are screwing ourselves up in the long run by not forging ahead with it now. I’m on the fence about the long-term sustainability of fracking, but I’m interested to give it a fair chance. And that’s because every time I encounter fracking in real life, it seems to be something of an unfairly-maligned energy solution whose bark is worse than its actual bite; whereas every time I encounter wind turbines I feel cheated somehow, like they’re promising to give me loads of energy and instead are leeching it out of the Earth. That said, anyone who’d go as far as setting up a website and a blog documenting the impact of fracking on their well-being, complaining about unfair and divisive planning decisions, underhanded corporate tactics and the industrialisation of the countryside…well, anyone who’d do that is probably a kindred spirit of mine deep down, aren’t they?! I’ll round up today’s entry with more stories about wind energy from my news feed over the last few days. Posting a link doesn’t mean I automatically agree with every word in it, that’s up to you to make up your own minds. If you care about the conservation of Britain’s wild, upland landscapes of outstanding natural beauty, and you believe that we as a society should prioritise the wellbeing of the hills and mountains that provide the source of our water, over any form of unnecessary development whatsoever, then you are part of the Peak Protection Force.